(Brussels, July 27 2018) The European Research Council (ERC) has today announced results of the latest Starting Grant call. Project with an acronym SUPERCOOL - Superelastic porous structures for efficient elastocaloric cooling led by doc. dr. Jaka Tušek of the Faculty of Mechanical Engineering at the University of Ljubljana was awarded support of almost 1.4 million Euros. Along with doc. dr. Tušek, further two Slovene researchers, who will carry out their ERC projects at institutions abroad, received support in this Starting Grant call. Dr. Veronika Fikfak will carry out her research at the University of Cambridge, UK, while Dr. David Šarlah will continue his research career at the University of Pavia, Italy. 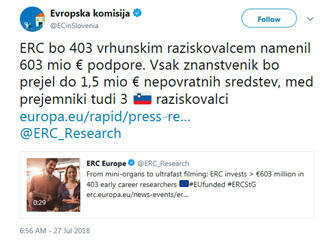 With this latest success, Slovenia based researchers have been successful seven times in ERC calls, conducting their ERC projects at host organisations in Slovenia (six grants are active at the moment). The grant of doc. dr. Tušek is the second Starting Grant, after 2011 awarded prof. dr. Nedjeljka Žagar of Faculty of Mathematics and Physics of University of Ljubljana (see also at Academia.net) and the second ERC grantee of the Faculty of Mechanical Engineering at the University of Ljubljana after Prof. Matevž Dular, winning a Consolidator Grant in 2017.